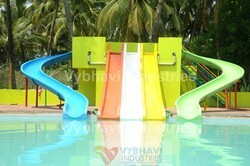 We are a leading Manufacturer of kids water slides, kiddies pool slides and kids pool slides from Vasai, India. Well-known in the industry as a manufacturer, supplier, and exporter, we are engrossed in offering Kids Water Slides. Under the guidance of professionals, who hold extensive knowledge of this domain, these slides are manufactured with perfection in accordance with the international quality standards. Offered at competitive prices, these slides are demanded in national and international markets. Since we have incepted in this industry, platform, we are immediately betrothed in the arena of presenting a different spectrum of Kiddies Pool Slides. Our product range includes Kids Pool Slides, which is installed in various amusement, theme, children & water parks. The water slides are available in various attractive designs, colors and sizes. We check the quality and standard of the slides on the basis of various well-defined parameters before the final delivery to the customers. Looking for Kids Water Park Slides ?